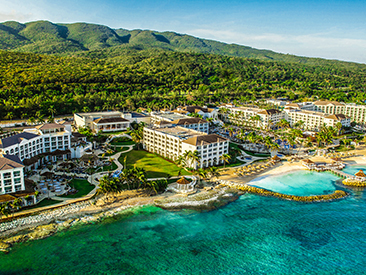 Hyatt Ziva Rose Hall Jamaica is an all-inclusive, family-friendly escape, tucked between the rising peaks of Jamaica’s famous mountains and pristine shores. 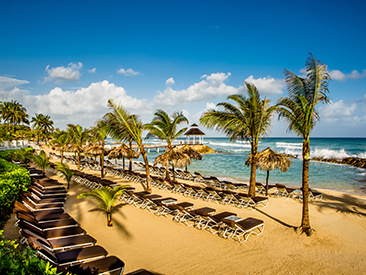 Here, guests of all ages are free to enjoy the best the island has to offer in all-inclusive splendor. From gourmet cuisine and accommodations to thrilling sports on land and sea, it’s an experience every member of the family will love! Tucked between the rising peaks of Jamaica’s famous mountains and the rippling waters that lap its pristine shores, Hyatt Ziva Rose Hall is a paradise of rest, relaxation and recreation. 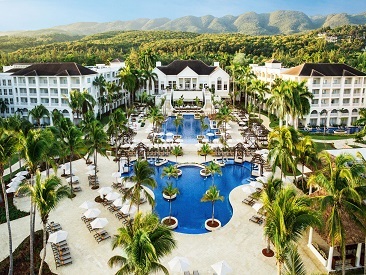 Here, guests of all ages are free to enjoy the best the island has to offer in all-inclusive splendor. From gourmet cuisine and accommodations to thrilling sports on land and sea, it’s an experience every member of the family will love! The resort is just 15 minutes from Sangster’s International Airport and five minutes from three world-class golf courses. - Catamaran Cruise for two limited to one cruise per room per stay (2 guests). Reservations are required and can be arranged by contacting the Resort Concierge for details and schedule. Catamaran Cruise provided by Island Routes. - Complimentary golf consists of Greens Fees for 1 round of golf (per adult) at White Witch or Cinnamon Hill golf course only. Cart, caddie, incidental charges and transfers to the golf course are the responsibility of the guest. Reservations are required and can be arranged through the resort concierge. - Not combinable with other promotional offers.